I have encountered many, especially in the midst of a cold bleak winter, who feel like they are stuck spiritually. They feel like somehow God, just like the weather, has turned a cold shoulder to them. It seems like He is as distant as the idea of summer in January - you have a memory of what it felt like to be warm, but it seems like a passing dream. Spiritually, this can feel like a sort of numbness towards God and the things of God. You may still be attending church, engaged in scripture study, prayer, and the like, but you feel like you're just spinning your wheels - getting nowhere. Soon, you begin to wonder if God is even there or real and if He is, does He care to listen when you do cry out. I don't pretend to know exactly how you feel or how you got there. I do know how it feels for me and how many others have told me it happens. Still, despite how much I care about you, I can't always help you get unstuck. I can offer some helpful thoughts and diagnostic questions to help you see some potential snares that may have contributed to your present stuck state. Understanding these may help you rock yourself out this rut or where you can find help. The first thought I usually have when someone says they feel like God is distant is... you're not alone. Many have gone through times of spiritual frustration or dryness. It's normal, don't freak out! The second thought is... He's not distant. Our emotions are not accurate measurements of God's proximity to us or His existence. Especially during the cold, dragging, and frankly depressing months of winter we need to be careful not to let our emotions get the best of us. If you've just careened through a stressful holiday season, you may be find that you're feeling tired, irritable, and a little burnt out. We underestimate how much busyness and stress impact our emotions and thus, if we are measuring our relationship with God by our emotions, our spiritual walk. So, in this time remember to hold on to the truth that you have buried in your heart (Psalm 145:18, Psalm 34:18, James 4:8, Hebrews 13:5) even when you don't feel it. That is a frequent theme in my life, to preach to myself the unchanging truth of God when my emotions and senses feel like the world is spinning around me. Measure your relationship with God based on the promises of God, not by your feelings. These promises can help you confront some unmet or even unrealistic expectations that you may have regarding God's work in your life. As you preach the Gospel to yourself, don't forget to confront sin. Sometimes unrepentant sin in our life creates disharmony with God that can be discouraging. Is there something you have done that you know is wrong, but you have shrugged it off and excused it? Is there something you know you should have done or said that you ignored or procrastinated to do? Do you need to seek forgiveness from someone you wronged? Do you need to forgive someone who wronged you? Asking yourself these kind of check-up questions from time-to-time is incredibly healthy for a believer. Realize also, that apart from busyness, stress, depression, emotional deception, unrealistic or unmet expectations, or unrepented sin, you may also be experiencing spiritual warfare. The enemy likes to paint God as distant and uncaring. Remember the Garden of Eden? He loves getting you to doubt God's goodness and desires for you. Fight back with truth and keep fighting the good fight. You will find God lifting you out of your mud and mire Psalm 40:2. Friend, I hope you can see that feeling stuck isn't a simple thing. You have to examine the factors that got you there to see how you might get unstuck. If your tracks aren't that obvious, then cry out to God. Ask him to reveal help around you. Talk to some wise counsel. Keep praying and digging into God's word. Keep reminding yourself of His truth and set your heart to delight in it even when you feel dry or alone. He will deliver you. He is an expert at that kind of rescue. Hang in there, you're not alone. You will come through this. I'm praying for you! 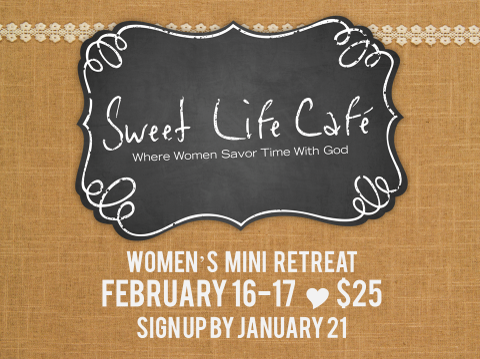 This week is the last one to sign up for Women's Mini Retreat! 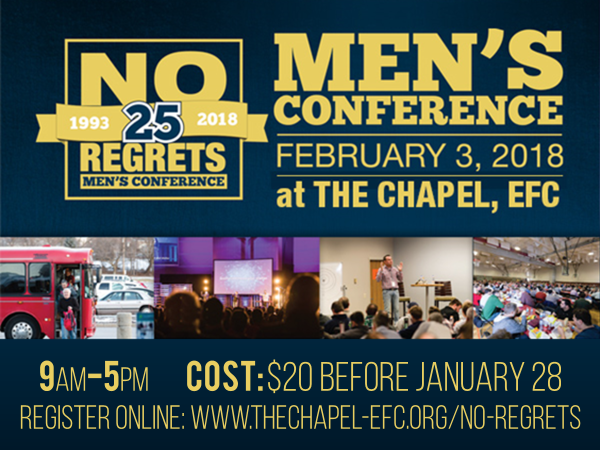 MEN, Technically you have two weeks to register for the Men's No Regrets Conference. We will have computers available in the lobby for you to sign up this week - don't forget. Don't regret missing this amazing conference. That is all for this week! Remember, above all: YOU ARE LOVED!